Let's talk about a normal person; Age, as well as gender, does not matter. It could be everyone. Our someone is neither very fit nor terribly strong. So someone who is secretly like any reasonable person afraid of an encroachment and has always avoided any physical altercation as much as possible. This person is confronted time and time again with people who are difficult to assess, do not make a trusting impression, and sometimes exude a certain unpredictable danger. So far it has always been fine; never was it alone in dark places with these characters and an incident has never occurred. - But will it always stay that way? What can one do now to be safe? To be on the go without fear and not completely defenseless in an emergency? There are basically three options for ordinary citizens: 1. to actively engage in weight training to become so strong that nobody dares to attack one. 2. to learn a martial art in order to be able to face a stronger opponent in a confrontation and to be able to successfully defend themself; and 3. remains as the most natural thing to do: a self-defense course. It is not difficult to see that options one and two are only suitable for those who enjoy such long-term physical exercise. It takes at least a year to get real benefits for your own safety. As an immediate solution, a self-defense seminar seem most logical. However, once again you face the problem: Without deep background knowledge and practical basics in any martial arts the beautiful ah-ha experiences of the seminar evaporate very quickly and leaves behind a dangerous bogus security, which can be fatal in an emergency. In the event ofa robbery on the go, there is no guarantee or ultimate aid that offers absolute protection in all cases. Even in the very unlikely event that firearms are allowed and free to be worn by us as in the U.S., it is far from being said that they can be properly and accurately used; you carry them with you at the crucial moment and hope that the other one does not handle them better and faster. This means that you should prepare yourself and be honest about the fact that you need some luck and you are only really safe if you never get into such a difficult situation (our first and most important tip!). So what can you do to increase your personal safety in the short term, so that you can go back on the road with the feeling of security and, in an emergency, actually be able to ward off an attack? 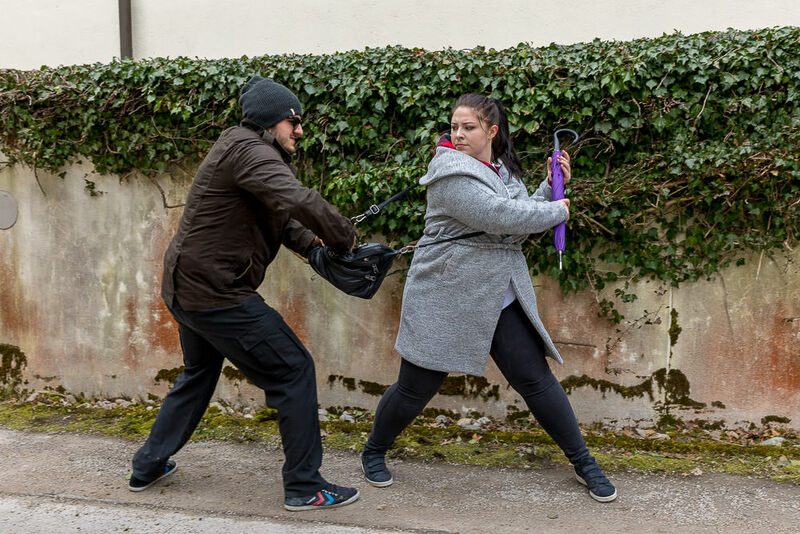 Due to the fact that you are unlikely to have any defense grounding or fighting experience, and you are reluctant to get in contact with the attacker, you need a tool that will strengthen you and help you keep a distance to the villain. You should be able to carry it anywhere and should be able to learn how to deal with it quickly. The solution to this is the security umbrella plus the right knowledge; focused on a few, easy-to-learn techniques that you can implement in the event of an emergency with the utmost security. The Security Umbrella is subject to no restrictions as a "common" everyday object worldwide. It can be carried everywhere, does not attract attention and does not provoke anyone. Subliminally, the Security Umbrella reinforces the impression of your ability to defend yourself and ensures that you are not even chosen as a victim. To use the Security Umbrella for self-protection, only a few, quickly learned techniques are required, such as: The correct posture; the correct umbrella position (It is very important to prevent the sSecurity Umbrella from being removed), the basic knowledge of using a pole to block, hit, and stab. You gain the necessary knowledge by studying our video course on DVD. We have produced a step-by-step guide that is easy for you to learn only what really matters in such a situation. We have consciously renounced any unnecessary addition. The DVD course offers you the following benefits: You learn at home at a time that suits you. You save yourself the effort (time and costs) to go somewhere. You go through the material according to your progress; everything that you already know or what you quickly understand, you can tick off accordingly; anything new or not so catchy you can repeat as often as necessary. You are not distracted by the trainer's mood of the day nor by questions from other participants. You can do these exercises with a person that you know and trust. If you are unsure in a few weeks, or would like a refresher in a few months or years, then simply reinsert the DVD at no additional cost and review the corresponding chapters. You will need around ten hours to watch the two DVDs and the accompanying exercises to learn the individual techniques that you will need so that you can actually defend yourself effectively. So you should expect about two to four weeks in the normal daily routine integrated. Of course it is necessary to repeat the exercises in the future in regular intervals in order to become steadily safer and to deepen the processes further. The additional DVD "Stayalive" provides everything you need to know to protect yourself without tools. This video training puts you in the position to protect yourself even without the security umbrella in the best possible way. This will enable you to defend yourself against an attacker in an emergency in about a month. Your total investment for the Security Package (Security Umbrella including two courses on DVD) amounts to, depending on the umbrella model, a maximum of 139 Euros. The Security Package is the most efficient and probably the best solution for companies, business owners, government agencies, field workers and travelers, as well as anyone more at risk of physical harm. Again: Of course, this type of self-protection does not offer an absolute guarantee; but this approach is certainly the most effective one you can choose for yourself (and your loved one). If you are on the go with the umbrella and feel the certainty that you can protect yourself effectively, you will not act like a victim, which will in turn keep some offenders from approaching you. This - and the chapter in our course on how to anticipate potential dangers early on and avoid them - is one of the most valuable things about this security package: avoiding confrontation. In 95% of all cases, the attacker is a casual and not a professional cold-blooded criminal. If, as we do not hope, you are confronted with such a situation, you will, in most cases, make a bold and determined counteraction to stop the attack. Our DVD courses will not make you a perfect fighter; But that is not necessary and we assume that you do not aim for it. You want more security and you get that in the best possible way, with an effort that does not charge you too much. The DVDs are your long-term source of knowledge and therefore, with the security package, you can maintain your defense capabilities for years to come. Of course a few self defense instructors will argue against it and point out the imperfection of this concept and the need for such seminars. But do they assure you in return that after their seminar you can ward off any attack successfully and without any injuries like Superman? - There may be good trainers and good seminars; but the likelihood that you are currently participating in one of them is similar to winning the lottery and it is simply a fact that after one, two or even more seminars you are not really sure and forget many things over time. - Self-defense seminars are just not perfect. Ask your instructor: Even the best trained martial artists, if it is possible, always prefer a defense tool. Because direct body contact carries pain as well as the risk of injury and very important, due to the possible use of concealed stabbing weapons, also a specific mortal danger. Get yourself, your family members, friends, co-workers etc. the Security Package. This allows everyone to effectively protect themselves in a short time. The security package is available in five different versions and with different umbrella styles. Detailed information can be found here on our website.